Dramatically enhancing the visual impact of what is already one of the architectural marvels of the Caspian coastline. 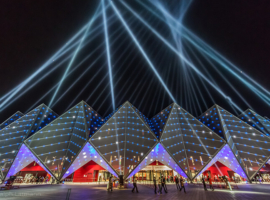 FALCON xenon searchlights became part of the permanent equipment of the Baku Crystal Hall in Azerbaijan. 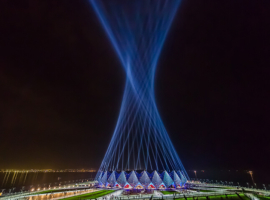 In all 38 FALCON BEAM colour 7000 watt searchlights are now on hand to summon visitors to events in the vast new building, dramatically enhancing the visual impact of what is already one of the architectural marvels of the Caspian coastline. The outdoor installation of 38 AO FALCON BEAM colour 7000 watts xenon searchlights surrounding the Crystal Hall for the Eurovision Song Contest – the lighting design was the work of German lighting designer Jerry P. Appelt – in the end filled the President of Azerbaijan, Ilham Aliyev, as well as the management of the Crystal Hall with such enthusiasm that they can now finally call the high-powered searchlights their own. 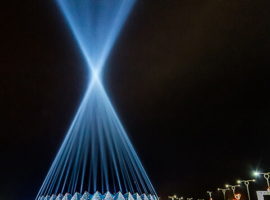 From now on, whenever an event is taking place in the Crystal Hall, the occasion will be marked by dancing beams of light visible for miles around. This dazzling and dynamic installation complements the already striking architecture to spectacular effect, lending it a majesty unrivalled in the region. Jerry P. Appelt was the man responsible for the lighting design of the new fixed installation as well as for that of the Eurovision Song Contest. 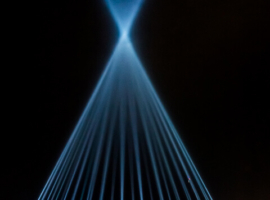 With it, he has built a bridge between staged entertainment and intelligent architectural lighting design. In his view, FALCON searchlights have “a unique selling point on account of their visual power” but he also places great value on their economic advantages, arguing that the “excellent value for money that they represent” and “their extreme reliability, and ability to survive long production periods without breaking down” are in his view just as important. Asked why he felt the FALCON BEAM searchlights formed a particularly appropriate adjunct to the Crystal Hall, Appelt explained; “The effect of the beams here is to extend the architecture, make the building visible for miles around and create what is in effect a visual landmark in way that with a conventional architectural illumination – which is not intended as a pejorative term – would have been quite impossible. The building itself is 30 metres high, but the effect of the lighting is to extend it further heavenward, ensuring that everyone in the entire city is informed when an event there is taking place. An extraordinary building like the Baku Crystal Hall certainly deserves extraordinary lighting. 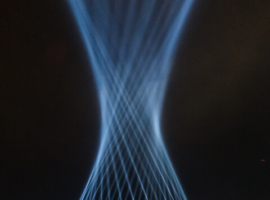 The images of the hall during the Eurovision Song Contest in May 2012, with its dancing beams of light constantly converging to form a tornado-like funnel, went all round the world.